Flash memory is a type of data that is widely used in applications ranging from smartphones and digital cameras to scientific and medical instruments. No matter the industry, the safe and secure storage of company data is a key priority for companies worldwide. 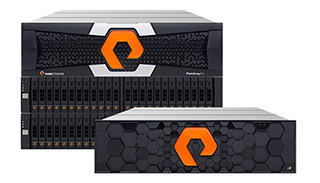 Pure Storage, an enterprise flash data storage company approached us with a design problem. The company wanted to add its logo on the front of the flash array chassis assembly. But this badge needed to do more than illuminate — it also needed to communicate status messages to customers. the badge was mounted on the exterior face a removable front panel, while the light pipe was connected to a fixed LED and had to be mounted on the interior face. This configuration meant a light coupler wasn’t an option, so our team had to design alternative solutions. The front panel of the chassis was made of a perforated metal in an intricate pattern, which provided very limited space for mounting the badge. The original design was there to stay, so revamping it to accommodate the badge wasn’t an option. Our team of designers quickly huddled to develop design ideas and solve our client’s challenge. The VCC team analyzed the opt-mechanical characteristics of the chassis unit, carefully considering the implications and requirements of each proposed design. We then leveraged a combination of CAD technology and advanced light modeling tools to run simulations on photometric and illumination properties to develop a solution that delivered optimal light to the original assembly design. Due to limited power availability in the chassis design, we also developed an LED module that connected to nearby USB port for power. Our team had to ensure that the light pipe was positioned perfectly with the USB power supply to deliver ideal illumination at all viewing angles. We used SLA and FDM technology to rapidly prototype and test our solution. 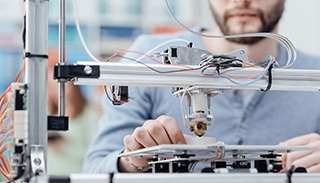 Once it passe the test, we tooled our solution using plastic injection molding, which greatly improved assembly time and reduced manufacturing costs. Our value-added services team helped our client solve a unique design challenge while improving overall product and assembly expenses.